From all of us at CrossFit Sioux Falls we miss you a very safe, healthy and Merry Christmas. It has been an extrodinary year for us. And we are thankful for us and everyone of you. 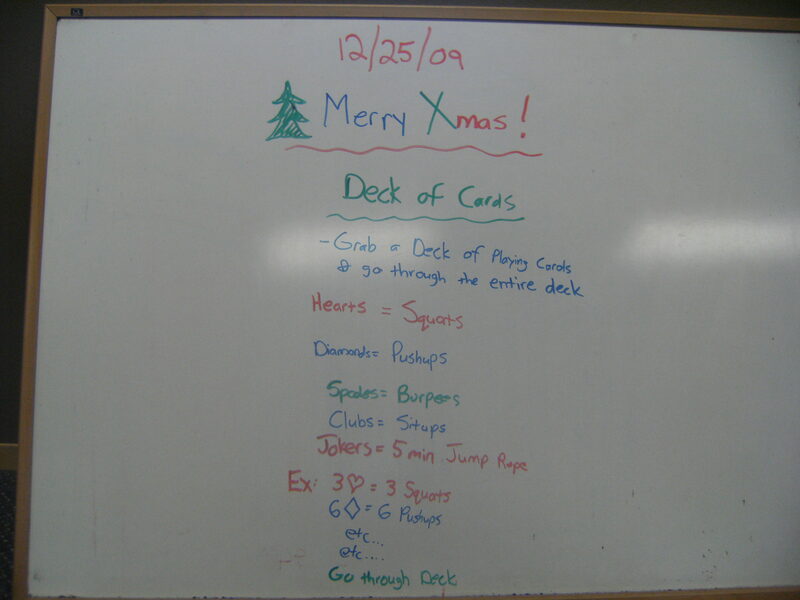 This entry was posted on December 25, 2009 at 6:00 am and is filed under CrossFit Workouts, Members. You can follow any responses to this entry through the RSS 2.0 feed. You can leave a response, or trackback from your own site. Man…who shuffled those cards! Burpees are my favorite! 24:11 as Rx’d…with the jokers strategically placed at the beginning and ending of the deck to prep my workout area for jump rope by the crackling fire. My twin nephews and niece helped flip the cards and say 3-2-1…go!!! Wishing my CFSF friends a Merry Christmas! P.S. Thanks to Chris and Annie for the at home WOD’s…going outside today is brutal!